For people who are in love with their rifles, finding the right kind of scope may prove difficult at times. One reason for this is that there are different kinds of scopes in the market with different specs and features. It’s undeniable that adding the suitable rifle is of utmost importance as it helps in target identification, thereby increasing overall accuracy. One of the best scopes on the market at the moment is the UTG 3-9×32 Compact CQB Bug Buster(View on Amazon.com). This article will serve as a UTG 3-9×32 Compact CQB Bug Buster review, covering the important aspects of the scope, features and benefits. First of all, UTG 3-9×32 Compact CQB Bug Buster is relatively cheap. Of course, there are more powerful scopes on the market, but when it comes to features and performance to price ratio, this scope is hard to beat. It’s possible to shop at the right place to get it at a much cheaper price, and also opt for the ones that offer free shipping fees. The UTG 3-9×32 Compact CQB Bug Buster is crafted based on a true-strength platform. Furthermore, the scope is completely sealed. To increase performance accuracy, the scope is nitrogen filled. There are other durability-related features that are included with this scope, such as waterproof, fog proof and shockproof. These built-in durability features are important, as rifles tend to experience tough situations such as being dropped, buried and kicked. The last thing that anyone would want is to have a broken scope halfway through a hunting campaign. The tube of UTG 3-9×32 Compact CQB Bug Buster is sized at one inch. Furthermore, it features an emerald-coated lens to increase clarity. The tube design and components are designed in a way to allow maximum light transmission. The UTG 3-9×32 Compact CQB Bug Buster features a premium zero reset table and zero lockable target turrets. The turret adjustments are precise and consistent, thanks to its 1/4 MOA per click adjustment. Furthermore, the UTG 3-9×32 Compact CQB Bug Buster also incorporates a range-estimating mid-dot reticle, which is great at providing optimal shooting performance. The scope also comes with an adjustable objective, which is adjustable up from 3 yards to infinity. It’s good at achieving a parallax-free view. The UTG 3-9×32 Compact CQB Bug Buster comes with two illumination features. Either green or red illumination can be chosen depending on the situation. 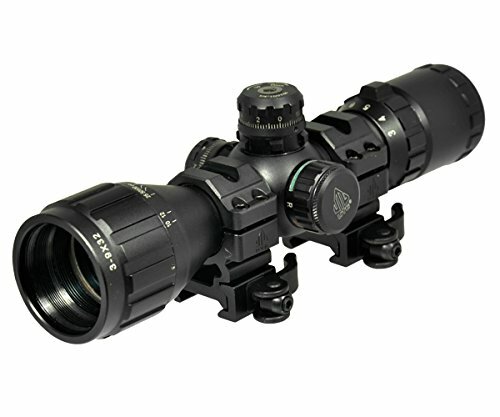 Because of the dual illumination, the scope is versatile in adapting in response to light and weather condition. This makes it the choice as a close range scope for an AR-15. There is not much to say about the UTG 3-9×32 Compact CQB Bug Buster, except that it offers great performance. While it is true that there are better scopes in terms of performance, but when it comes to price to performance ratio, it’s one of the best scopes out there. The scope has great and useful features, its built and offers a crystal clear view. All in all, this makes UTG 3-9×32 Compact CQB Bug Buster as one of the best scopes on the market right now. For some more great details on how this scope can function with your application, check out the brief video below.